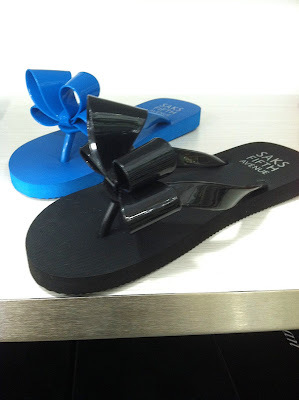 While browsing for a pair of black flats at Saks outlet the other day, I came across this pair of bow sandals. Well, it is darn cold out but I can think ahead for summer, right!! Since I am rather partial to bow anything, I can definitely see myself wearing these the whole summer. Besides, I like I do prefer rubber sole to plastic sole like the Valentino below for comfort level. 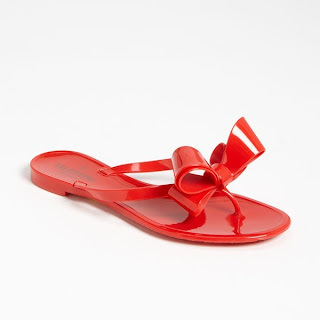 Currently Valentino is still making plastic sandals with the bow. At $295 (image via nordstrom.com), it is slightly pricey in my eyes for a pair of casual sandals. Valentino design is more refined but I think at only 1/10 of the cost, I am perfectly happy with Saks brand bow sandals. Which one do you like more?? love the valentino's but i could never justify spending that much on a pair of plastic flats.. but they did come out out with a fuchsia colored on this spring that is just too cute! Hmm tough choice. I like the thinner sole of the Valentino, but for that price, a thin sole is not enough justification! they are really cute, not too much difference!